150-gram pressing by Quality Record Pressings! Forty-five years after a pivotal year in the too-short career of Creedence Clearwater Revival, Fantasy Records is celebrating the genius that is Creedence with a series of commemorative reissues. In 1969 there was simply no stopping Creedence Clearwater Revival. That epic year they released three Top Ten albums, had four hit singles (charting at #2, #2, #2 and #3, respectively) with three additional charting B-sides. They even found time to record a fourth chart-topping album released the following year. In addition to the incredible quantity and quality of their albums, Creedence — Doug Clifford, Stu Cook, and Tom and John Fogerty — also headlined the Woodstock music festival, played on the Ed Sullivan Show twice and toured throughout America. 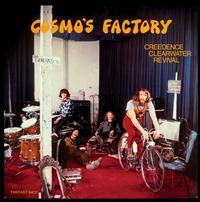 Fantasy's Creedence vinyl reissues series, which will continue throughout 2014, launches with Bayou Country and Cosmo's Factory. It was in January 1969 that Creedence released the first of its three LPs that year, Bayou Country. The product of frontman/songwriter John Fogerty's fascination with Louisiana swamp-rock and R&B, the album contained the hits "Proud Mary" and "Born on the Bayou" and key FM radio tracks "Graveyard Train," "Keep On Choogling" and a cover of Little Richard's "Good Golly Miss Molly." According to AllMusic.com, "Bayou Country announces that CCR had discovered its sound." Cosmo's Factory, released July 1970, included the hits "Traveling Band" and its hit B-side "Who'll Stop the Rain," "Lookin' Out My Back Door," "Run Through the Jungle," and a swampy 11-minute rendition of the Marvin Gaye hit "I Heard It Through the Grapevine." The album, cited in Rolling Stone's 500 Greatest Albums of All Time, was named after the room in which the band — John, his brother Tom (on rhythm guitar and some lead vocals), bassist Stu Cook, and drummer Doug Clifford — used to practice. By 1990, it had been certified four times platinum (4,000,000 units sold) by the RIAA. Fantasy will release the remaining 1969 albums — Willy and the Poor Boys and Green River — on vinyl later in 2014.